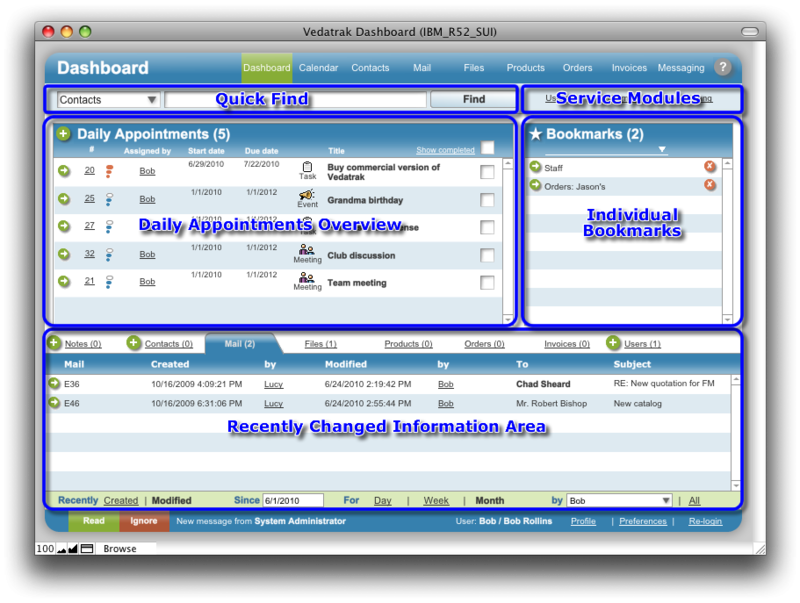 Dashboard allows quick access to important information when you start work in Vedatrak. Select the information type you're looking for from the Type drop down menu. Enter the information that you want to find into the field and click Find to return a set of matches. The Daily Appointments area displays today's appointments. To add new appointment, click New next to Daily Appointments. To edit, view or comment on an existing appointment, click Edit/View next to the appointment to open the Edit Appointment window. Check or uncheck the box next to Show Completed to display or hide completed appointments. Click the Completed check box to the right of the appointment to mark the appointment as Completed. Use Bookmarks to easily access Vedatrak items you use frequently. Click Edit/View to the left of the bookmark to access it. Use the Type drop down menu to filter bookmarks by type. Click the Delete button to the right of the bookmark to remove it from your bookmarks. In the Recently Changed Information Area is all recently changed information within Vedatrak that's accessible by you. Records can be filtered by change type (Recently Created or Recently Modified), the Since date (including quick links Day, Week or Month) and by user (including quick links Me or All). Use tabs to see recently changed information by module. Click Edit/View to navigate to the changed record . To add a new record in Notes, Contacts and Users tabs only, click New next to the corresponding tab. The first tab in the Recently Changed Information Area is Notes. Vedatrak users can post team-wide notifications in this area. To add a new note, click New on the Notes tab. Notes can be filtered in the same manner as the rest of the tabs. Click Delete to the right of the note to delete it. 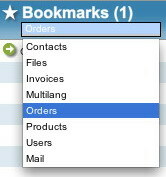 Use the Service Modules navigation bar to quickly access Users, Themes and MultiLang modules. Note: These functions are available only to the System Administrator and Administrator.